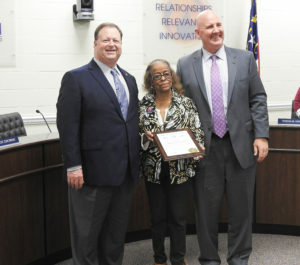 Recently retired Johnston County School Board members Butler Hall and Dorothy Johnson were recognized at the April meeting of the Board of Education. Both knew they would be honored at the meeting but were surprised to learn they were each being presented with the Order of the Long Leaf Pine, the highest civilian honor in the State of North Carolina. Hall began his teaching career in Coward, SC as a seventh grade Social Studies and English teacher and coach. Later he taught U.S. history and continuing coaching. He was also a principal at North Johnston High. After retirement he returned as interim principal for 6 months. 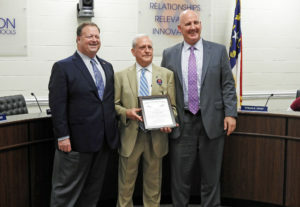 After 34 years as an educator he served 12 years on the Johnston County School Board. Dorothy Johnson spent 30 years as a County Home Economist with the NC Agricultural Extension Service and also served in an acting capacity as County Extension Chairman. She was a very involved parent who took pride in the Johnston County school system. Her work didn’t go unnoticed and she was appointed to serve on her children’s school advisory council, to lead the Clayton Elementary School PTA as President, and then to run for the Board of Education. “When you run for the School Board, you should have good reason, a vested interest,” Mrs. Johnson said. As a member of the school board she was known for her practical approach to policy-making and execution, and her commitment to fairness and diversity of thought. She prided herself on listening to and representing all citizens of Johnston County. She regularly lobbied for a safe and disciplined school environment and applauded character-driven education that promoted values, worth, and dignity for every student. At Cooper Elementary in Clayton there is the Dorothy Johnson Media Center. She was nationally recognized in 1987 with the Florence Gail Award for outstanding programs in areas related to home economics. She also earned the Clayton Leadership Appreciation Award from the Clayton Rotary Club in 2005. Mrs. Johnson served 21 years on the school board, including 18 years as Vice Chair. She may have retired from her seat but not from her service to her community.